Police To Trace Body Of Ugandan Officer Who Died In Ethiopian Airlines Plane Crash. 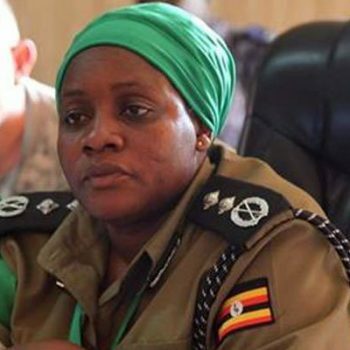 Police in Uganda have formed a task team to trace the remains of Commissioner of Police (CP) Christine Alalo, who was on-board of Nairobi-bound Ethiopian Airlines jet that crashed on Sunday, six minutes after take-off from Addis Ababa. Police spokesperson, Mr Fred Enanga on Monday confirmed that CP Alalo was among the 157 people who died on Sunday in the plane crash. He said CP Alalo was working with the African Mission in Somalia (AMISOM), as the acting Police Commissioner. “The officer was returning from Italy to Mogadishu, Somalia and was one of the victims in the Ethiopian Flight ET 302, which crashed yesterday killing all its 157 occupants,” he said. Mr Enanga said in the statement that the Inspector General of Police Okoth Ochola has shared the sad news with the immediate family members of the fallen officer and created a task team headed by the Director of Peace Support Operations AIGP Grace Turyagumanawe, to coordinate with both the AU headquarters and Ethiopian Airlines to ensure her remains are traced and transported to her family in Uganda for burial. “At the time of her death, CP Alalo was serving as the Acting Police Commissioner AMISOM and her tour of duty was expected to end in June, 2019. She joined the police as a cadet/ ASP on August 18, 2001 and served as in various capacities of command. She was a highly respected member of the force who loved her job. She died while on duty and ably carried the image of the force and our country Uganda to greater heights and will be sadly missed,’ Mr Enanga said in the statement. He said CP Alalo is survived by two sons, Emmanuel and Alvin. M Enanga said Ethiopian Airlines said it will work with Boeing, the national civil aviation authority and international experts in trying to unravel what caused the brand new plane to come down just six minutes into its flight. Eight crew and 149 passengers from 35 countries perished when Flight ET 302 ploughed into a field near Tulu Fara village outside the town of Bishoftu, some 60 kilometres (40 miles) southeast of Addis Ababa. A witness told media Sunday the plane came down in flames. “The plane was already on fire when it crashed to the ground. The crash caused a big explosion,” Tegegn Dechasa recounted at the site, littered with passenger belongings, human remains, and airplane parts around a massive crater at the point of impact. “The plane was in flames in its rear side shortly before the crash. The plane was swerving erratically before the crash. Among the dead were tourists, business travelers, and UN staff, including some who worked for the World Food Programme, the UN refugee agency (UNHCR) and the international Organization for Migration. The IOM said in a statement early indications were that 19 staff members of UN-affiliated organisations perished in the crash. Many were headed for an annual assembly of the UN Environment Programme, which opens in Nairobi Monday with some 4,700 heads of state, ministers, business leaders, senior UN officials and civil society representatives. Ethiopian Airlines, the continent’s biggest carrier, said “the search will continue in the morning”. “A committee comprising of Ethiopian Airlines, Ethiopian Civil Aviation Authority and Ethiopian Transport Authority has been set up to carry out the investigations,” it added. The US National Transportation Safety Board said it would send investigators to assist, and Canada, which lost 18 citizens, said consular officials were “immediately deployed” to Addis Ababa to determine the facts. Ethiopia’s parliament declared a national day of mourning for Monday amid a global stream of condolences. “Deeply saddened by the news this morning of the plane crash in Ethiopia, claiming the lives of all on board,” tweeted UN Secretary General Antonio Guterres. According to the airline, Kenya had the largest number of casualties with 32, followed by Canada with 18, Ethiopia 9, then Italy, China, and the United States with 8 each. Britain and France each had 7 people on board, Egypt 6, and Germany 5 — though the breakdown was not final.